For the first time since the 2015-2016 season the Quinnipiac Bobcats have started a season 3-0. Goal-tending and defense were the key to victory as Quinnipiac shutout 18th ranked Boston College 1-0 before a sellout crowd at the Frank Perotti, Jr. Arena in Hamden, CT. With the loss Boston College starts a season 0-3 for the first time since 1937 while they have not beaten a non conference opponent since the 2016 season. Quinnipiac sophomore goaltender Keith Petruzzelli made his third consecutive start and was a brick wall tonight making 21 saves en route to his first career collegiate shutout. He was helped by a Bobcat defense that blocked 12 shots and stifled a talented Eagles offense with NHL first round pick Oliver Wahlstrom being held to one shot on goal. 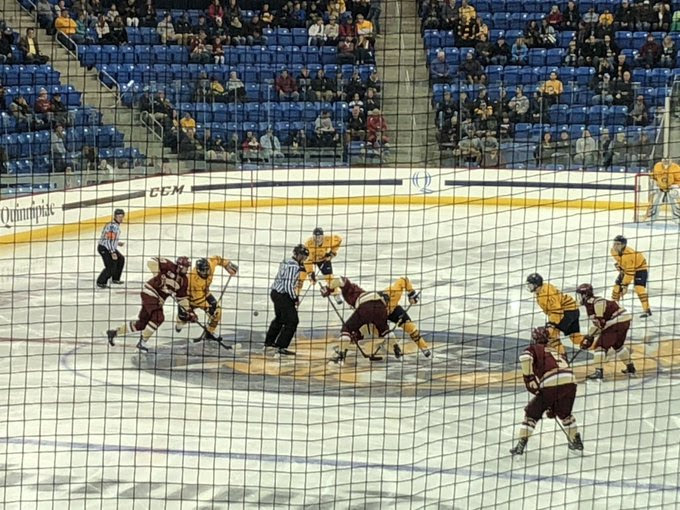 The Quinnipiac defense was forced to play big early with two Boston College power plays in the within the first 13 minutes of the game. Both times Quinnipiac killed off the Eagles man advantage and in turn only held Boston College to just three shots on goal in the entire first period. Late in the first period Boston College took back to back slashing penalties by Marc McLaughlin and Michael Kim respectively and Quinnipiac made them pay towards the end of the five on three advantage when Brandon Fortunato fed Chase Priskie just outside the top circle who ripped a one-timer past Boston College goaltender Joseph Woll (25 saves). It was all the offense the Bobcats would need in this game as they fended off a strong challenge in the second and third periods when Boston College turned up the pressure a bit with 18 total shots. An underrated play of the game was at the 17:34 mark of third period when Quinnipiac freshman William Fallstrom drew a hooking penalty on BC's Logan Hutsko which prevented the Eagles from pulling Woll and giving Quinnipiac the opportunity to play keep away on the power play to run out the clock. With the win Quinnipiac moves to 3-0-1 all-time against the Eagles dating back to their first meeting in the 2016 Frozen Four National Semifinals. Quinnipiac now plays a two game series with AIC of the Atlantic Hockey Conference starting with a Friday game on the road followed by a Saturday game in Hamden.